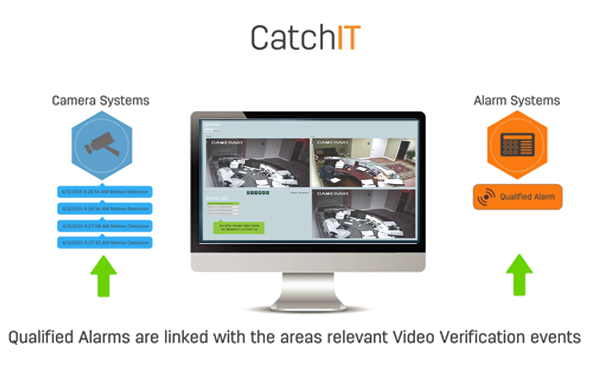 Patriots CatchIt System will utilize the camera systems video events, live feed, remote set/unset control and event notifications to streamline the video verification process so operators have all the information they need on one screen to make a quick and accurate response. The Patriot Video Recording Module will record all video viewed by an operator using any of the embedded video interfaces Patriot supports. The recorded video is tagged with the operator actions taken when responding to the alarm event, so it can easily be reviewed after the incident is completed. The recorded video is also automatically archived for easy future reference. 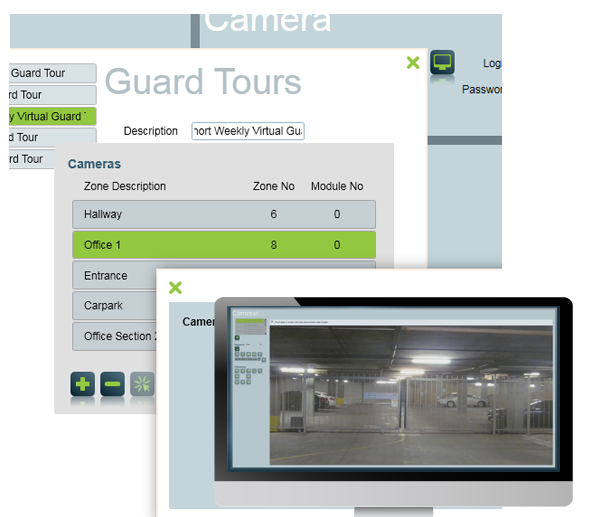 Patriot Guard Tour Module allows remote monitoring of sites and ensures the safety of solo workers. Local Video Recording of video events provide a backup of the video for audit purposes and will also record operator actions. Click on the camera type below to display more details on each Module. Contact Patriot sales to find out more about a module or if a specific camera system is supported. Patriots Hikvision Module provides integration to Hikvision DVR systems which are compatible with a wide range of high resolution CCTV and surveillance hardware including the latest smart IP cameras. Seamless integration with Hikvision cameras and DVRs give Patriot operators immediate visual confirmation of any crime-in-progress thus eliminating false alarms and prioritising the response to an event. This module provides operators with a direct visual reference of clientâ€™s premises directly through the Patriot alarm response process, the alarm activations window or optionally as an on-demand function via the client maintenance window. Advanced controls are dependant on Camera/DVR hardware. Patriots Samsung Module provides integration to Samsung DVR systems. Seamless integration with Samsung cameras and DVRs give Patriot operators immediate visual confirmation of any crime-in-progress thus eliminating false alarms and prioritising the response to an event. This module provides operators with a direct visual reference of clientâ€™s premises directly through the Patriot alarm response process, the alarm activations window or optionally as an on-demand function via the client maintenance window. Advanced controls are dependant on Camera/DVR hardware and can include two way audio. Patriots Avigilon Camera Modules provides integration with Avigilon Camera Systems. Patriots ONVIF Camera Module will allow Patriot to connect and display ONVIF cameras live feed within the Patriot Camera interface. Many camaeras use ONVIF now so this Module will work with a range of different brands and camera systems. Patriots RTSP Camera Module will allow Patriot to connect and display RTSP cameras live feed within the Patriot Camera interface. Many camaeras use RTSP so this Module will work with a huge range of different brands and camera systems. Patriots Rialto Camera Modules provides integration with Rialto Camera Systems. Patriot integration with Risco Groupâ€™s Agility wireless security systems utilizes visual verification which enables operators to view images taken by cameras at monitored premises. Visual alarm activation data provides Patriot operators with immediate confirmation of any crime-in-progress thus eliminating false alarms and prioritising the response to an event. Patriots Bosch Camera Module provides integration with Bosch DVRs. Patriots Mobotix Camera Module provides integration with Mobotix Camera Systems. Patriots Pacom Camera Modules provides integration with Pacom Camera Systems. Patriot integrates with Heitel software to provide alarm signalling and video verification of alarm activations. The video verification is received from the Heitel software which can be immediately reviewed by Patriot operators as required. Patriot operators can invoke and use the Heitel application with all its options for viewing and manipulation of video data. Patriots Dahua Camera Module provides integration with Dahua Camera Systems including Live Feed and Video Verification. Patriots Dowshu Camera Module provides integration with Dowshu Camera Systems. Patriots UDP Camera Modules provides integration with UDP Camera Systems. Patriot VideoIQ Module provides integration with the VideoIQ platform, including the ICVR-HD high definition cameras. Compatible with CCTV cameras and IP cameras VideoIQ integration with Patriot allows a direct visual reference of clientâ€™s premises through the alarm response procedure or optionally as an on-demand function via the client maintenance window. Patriots ADDER Module provides integration with ADDERâ€™s digital recording and detection monitoring cameras. Compatible with CCTV cameras and IP cameras ADDER integration with Patriot allows a direct visual reference of clientâ€™s premises through the alarm response procedure or optionally as an on-demand function via the client maintenance window. Patriots OzVision Module provides integration to the OzVision CCTV product and is used in conjunction with OzVison receiver software. Patriot operators can invoke and use the OzVision application via camera icons in the alarm response procedure or, optionally, on demand via the client maintenance windows. This provides access to all the extended features of the OzVision Interface. Patriot's Videofied Frontel Module integrates Patriot to the Videofied Frontel alarm signalling and video verification system of alarm activations. The Video verification is received in the form of a video clip which can be viewed as necessary. Patriot operators can invoke and use the VideoFied Frontel application with all its options for viewing and manipulation of video data. Patriots Dedicated Micros Module provides integration to the DM NetVu CCTV platform. Patriot operators can use the standard Patriot camera interface which provides a GUI for the NetVu application. This provides access to most of the features of the DM software so operators can seamlessly view distributed images from any NetVu Connected product such as SD Advanced, EcoSense, CamVu 2000 or DV-IP Server. DM NetVu enabled DVRs and camera feeds are available as part of the alarm response procedure or optionally as an on-demand function via the client maintenance windows. Patriots AdPro Platinum Camera Module provides integration with Adpro Platinum which allows activations from AdPro sites to be identified and responded to as they occur. AdPro CCTV cameras are available as part of the alarm response procedure or, optionally, on demand via client maintenance windows. Patriot operators invoke the Platinum from within Patriot and this provides access to extended feature of the AdPro software. Patriot Visonic Module provides integration with Visonic DVR and camera systems. The cameras live feed is available on demand through the Patriot interface creating seemless video camera viewing system within Patriot. Patriots We.R Camera Module provides integration with We.R Camera Systems. Patriots Davantis Camera Module provides integration with Davantis Camera Systems. Davantis provides advanced camera, analytic and alarm events that combined with Patriot provide a premium monitoring service for your clients. As well as showing a video of the event that caused the alarm activation you can also View Video on demand through the Davantis Module with compatible hardware. Patriot will receive Davantis analytic events such as the Davantis perimeter protection solution which is certified as a primary monitoring system by the UKâ€™s Home Office Scientific Development Branch (HOSDB), specifically as an i-LIDSÂ® approved primary detection system for operational alert use in sterile zone monitoring applications.